themes while travelling through Sappho, Washington. The mountain walks over the water! Rain down from the mountain! out parked in the rain. boulder in the creek never moves the water is always falling together! 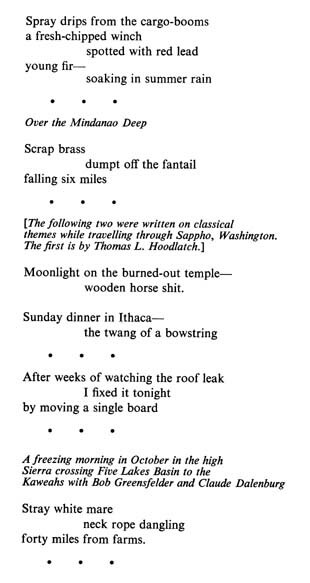 There are exemplary haiku in Gary Snyder’s Danger on Peaks, such as “Cool Clay” (28), “Catching grasshoppers for bait” (35), “Warm nights” (37), and many more. Udo Wenzel: Unlike to the haiku in English the German haiku scene made its first experiences with the so called "free-format haiku" only a few years ago. Since that time it is an unanswered question how to define a haiku or how to distinguish it from other lyrics and poetry styles. You started more than 50 years ago to write haiku. And from the beginning you didn’t pay attention to the most common definition of what a haiku is or might be: 5-7-5 syllables-counting and the required use of a seasonal word. How did this happen? Gary Snyder: I have never called my brief poems "haiku" except in certain rare cases where a brief poem met what I felt were the key aesthetic requirement of a top quality haiku — which means among other things, freedom from ego. I do not think we should even "think" haiku in other languages and cultures. We should think brief, or short poems. They can be in the moment, be observant, be condensed and meaningful, detached or not, or have many other possible qualities except perhaps satire, parody, anger, and such. That territory belongs, in Japanese, to "Senryu." I don't think counting 5,7,5 syllables is necessary or desirable. To reflect the natural world, and the season, is to reflect what is. Many modern haiku in Japan won't have a kigo, a "season word." Udo Wenzel: Do you believe that the haiku at heart is not portable into other languages and cultures? Do you think, the American or European Haiku is a “sham package”? Gary Snyder: As I am trying to say, the haiku is a Japanese poetic form. It has elements that can indeed be developed in the poetries of other languages and cultures, but not by slavish imitation. To get haiku into other languages, get to the "heart" of haiku, which has something to do with Zen practice and with practiced observation -- not mere counting of syllables. Udo Wenzel: In 1956, after you had left the North American West-Coast and the community of beat poets, you moved to Japan, where you lived for the next twelve years, studying Chinese and Japanese language and receiving teachings in a Zen-monastery. Did you come in touch with haijins? What would you say, did your view of haiku change, as you faced it in its origin country? Gary Snyder:I met no haiku poets with the exception of Nakagawa Soen Roshi at his temple near Mt. Fuji. I stayed there two nights, and went for a walk with him up the mountain. We never talked about poetry. Later I learned he was a very highly regarded haiku poet as well as a Zen Master. Some of the Zen monks down in Kyoto thought little of him, saying "If he was serious about teaching Zen he wouldn't be always going to those haiku poet meetings in Tokyo." I didn't have a fixed view of haiku when I went there so I can't say it changed. Udo Wenzel: It is well known that you are not a Haiku Poet primarily, but you have used haiku within prose (it reminds me of the tradition of Bashô’s haibun). Above all you’ve integrated haiku within longer poems. Did you have literary models für this technique? Udo Wenzel: Could you please give us your definition of what a haiku is? 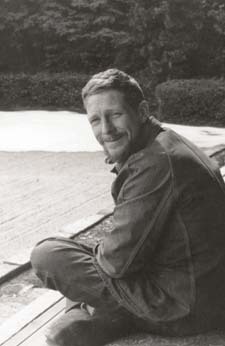 Gary Snyder:A haiku is a short Japanese poem that is both very easy and extremely difficult to do. Huge numbers of people all over the country write them daily. Many are in the newspapers. They have a set of rules and guidelines which are not followed slavishly. It is hard to appreciate haiku fully in translation because much of their power is in the tricks done with the syntax. Although the greatest haiku are among the finest utterances in the world, the huge number of lesser haiku play a valuable and enlivening role in the culture. Non-Japanese societies can learn from this tradition and feel free to write brief poems that are strong "news of the day, news of the moment" – and fundamentally without ego. Udo Wenzel: Who writes, if a haiku is written without ego? Would you please explain, what does it mean to write without ego. How can one recognize such a haiku? Could you give us an example? Gary Snyder: Hakuin Zenji's "Song of Meditation" has the line "true nature that is no-nature, far beyond mere doctrine." Dogen Zenji says, "We study the self to forget the self." No nature is true nature, non-ego is the mysterious power of creation. How do you recognize such a haiku and what are examples? Just remember the great haiku from the Japanese tradition that first made you fascinated with haiku when you were fresh to the field, poems by those we call "the masters." Udo Wenzel: Even though the Japanese Haiku could be better described as seasonal poetry than as nature poetry, nature and landscape were always in the core of haiku poetry. 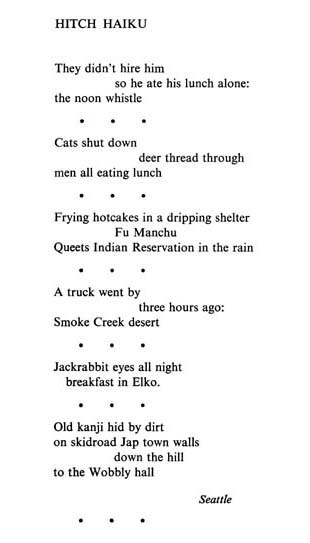 In Dharma Bums one could read, in which kind you created haiku in the fifties. Following oral poetry traditions, you called out the haiku to each other on hikings and you did not write it down. I suppose this discounts the aspect of Japanese haiku being lingustic works of art, as we know, the haijins polished it often for a long time. What would you say today, which value has language in haiku poetry? Gary Snyder:You can't call out, sing, speak, write or say any song or poem without language. Language always has syntax. Some people have a talent for language more than others. To get good at language you have to listen a lot. Udo Wenzel: In your writings you often turn against conventional dichotomies, for example against the dichotomy between nature and language/culture order nature and civilisation. On the one hand you extended the term of nature into the human realm, on the other hand „wilderness“ is an important concept for you. What is their part related to poetry? Gary Snyder:My prose book of ecological philosophy,"The Practice of the Wild", has detailed explication of these questions, and careful definitions of the words "nature" and "wild" (which should be understood as not identical with "wilderness.") Hanfried Blume has recently finished his German translation of this book and it will be published by Matthes and Seitz press in the coming year. Udo Wenzel: For the haibun „The Narrow Road to the Deep North„ Bashô visited during his long journey the so-called utamakura ("poem pillows"), places which were already enriched with cultural and literary meanings, and he wrote about them in a fresh and fancy manner. You often described in your poems and prose the landscapes of the North-American West. One of your main projects is „Mountain and River Without End“. In what way are you influenced by Bashô? Gary Snyder:"Mountains and Rivers Without End" was finished in 1996. Bashô was an earlier influence for me but so was Buson. The biggest single literary influence on this long poem was Noh drama, in particular the play "Yamamba". Udo Wenzel: Once you labeled yourself as a „Buddhist poet“. How would you personally describe the connection between religion and poetry? Gary Snyder:I like what the Zen Master Dôgen said in the 13th century. "We Study the Self to forget the Self. When you forget the Self you become one with the entire phenomenal world." Udo Wenzel: Did you write poems which are close to haiku recently? Would you kindly present some of it? Gary Snyder:The place best to find my recent short poems and "haibun-like" poems is in my recent volume of poetry called "Danger on Peaks". This was recently translated into German published by his Stadtlichter Press. Sebastian Schmidt (transl.) Gefahr auf den Gipfeln (Berlin: Stadtlichter Presse, 2006). This has a block of very short poems, and also a whole section called "Dust in the Wind" which has prose-block plus brief poem. Coyotes yipping in the starry early dawn. Udo Wenzel: Thank you very much for the interview. from "The Path to Matsuyama"
Modern Haiku 36.2, Summer 2005. I was from a proud, somewhat educated farming and working family. After finishing college I went back to work. I went into the National Forests to be an isolated fire lookout living in a tiny cabin on the top of a peak. I worked as a summertime firefighter and wilderness ranger, and then spent winters in San Francisco to be closer to a community of writers. I discovered the four-volume set of haiku translations by R. H. Blyth that now we all know so well. Reading the four Blyth volumes gave me my first clear sense of the marvelous power of haiku. (The other reading of that era that helped shape my life was books by D.T. Suzuki.) I lived with Blyth’s translations for a long time, and began to be able to see our North American landscapes in the light of haiku sensibility (which of course includes the human.) When I ran across Bashô’s great instruction “To learn of the pine tree, go to the pine” my path was set. In the fall of 1953 I moved to Berkeley and entered as a graduate student in East Asian Languages at the University of California. I read Chinese poetry with Dr. Chen Shih-hsiang and translated poems of the Chinese Zen poet Han-shan/Kanzan. I studied Japanese with Dr. Donald Shively. This was 1954. Through Dr. Shively I got to know the formidable American Buddhist scholar Ruth F. Sasaki, who had been married to the Japanese Zen Master Sasaki Shigetsu. They had met before World War II when he was teaching Rinzai Zen in a little zendô zend in New York City. He died during the war. Mrs. Sasaki returned to Kyoto after the war to continue her Zen training with Sasaki Shigetsu’s Dharma brother Gotô Zuigan Roshi. She was also hard at work translating and publishing Zen texts. She offered to help me get to Kyoto, saying that it would deepen my knowledge of Japanese and Chinese, and give me an opportunity for first-hand Rinzai Zen practice. Just as I was preparing to leave the West Coast I got involved with the literary circles that are now remembered as the “Beat Generation” in San Francisco. I participated in poetry readings and had some minor publications. Those early poems already show the influence of haiku with strong short verses contained within longer poems. This was a strategy that came to me through W.C. Williams and Ezra Pound. I first arrived in Japan in May of 1956. Exposure to Buddhist scholars and translators soon brought me to the Zenrinkushu, that remarkable anthology of bits and pieces of Chinese poetry plus a number of folk proverbs as they became used within the Zen world as part of the training dialog. If one was looking at the possibilities of “short poems” the Zenrinkushu practice of breaking up Chinese poems would certainly have to be included. R.H. Blyth famously said “The Zenrinkushu is Chinese poetry on its way to becoming haiku.” Maybe it is that somebody — one of the old Zen monk editors — realized that practically all poems are too long and that they’d be better if they were cut up. So he cut up hundreds of Chinese poems and came out with new, shorter poems! I now know I was extremely fortunate to have been exposed to the elegant “Zen culture” aspects of Kyoto. But as I traveled around Japan I came to thoroughly appreciate popular culture, ordinary people’s lives, and the brave irreverent progressive vitality of postwar Japanese life. I realized that the spirit of haiku comes as much from that daily-life spirit as it does from “high culture” — and still, haiku is totally refined. I returned to North America in 1968 (Some of us prefer to call it “Turtle Island” after Native American creation stories). In 1970 I moved with my family to a remote plot of forest land in the Sierra Nevada at the 1,000-meter elevation — pine and oak woods. We built a house and have made that our home base ever since. (which is no longer spoken) and I can see how much they valued the magic of the woodpecker, the sly character of fox, and the trickster coyote. High-flying migratory sandhill cranes pass north and south in the spring and in the fall directly over my house. They have been doing this for at least a million years. The Euro-, African-, and Asian-Americans are just a little more than 200 years on the west coast of North America, and it will be several centuries yet before our poetic vocabulary matches the land. The haiku tradition gives us the pointers that we need to begin this process, which will be part of making a culture and a home in North America (and I hope eventually, for all people, a home on planet earth) for the long future ahead. The ancient Buddhist teaching of non-harming and respect for all of nature, (which is quietly present within the haiku tradition) is an ethical precept we are in greater need of now than ever, as the explosive energy of the modern industrial world pushes relentlessly toward an endless exploitation of all the resources of the planet. Now I want to go back to talking about how Japanese haiku poetry has been discovered world-wide. Up till now I have been speaking of haiku as it exists in Japan from early times up to the present. Though haiku may be considered old fashioned and conservative by some people in Japan, in the rest of the world it is received as fresh, new, experimental, youthful and playful, unpretentious, and available to students and beginners who want to try out a poetic way of speaking. As we all know there’s scarcely a literate culture on earth that doesn’t have some translations of Japanese haiku in its poetry anthologies. From this, an international non-Japanese haiku movement has begun, which takes the idea of haiku hundreds of new directions. School teachers in Denmark, Italy, or California have no hesitation giving translations of Japanese haiku to their students, and then also reading locally-written brief poems to them, telling the children to look around, see what they see, have a thought, make an image, and write their own brief poem. Children everywhere are learning about poetry and themselves just this way. Though this may not be entirely true to the haiku tradition itself, it is of immense value to young people to have their language and imagination liberated. Short poems and haiku inspire them more than the usual English or European-language poetry which always seems (to children) either too metrical and formal or too modern and experimental. The haiku tradition is now part of a world-wide experimental movement in freshly teaching poetry in the schools. This is another reason to celebrate haiku. As a teacher in the graduate creative writing program at the University of California at Davis, I taught the haiku tradition to older students on a serious poetry-writing track, using Robert Hass’s superb book The Essential Haiku, and it was as surprising and useful to these sophisticated young adults as to any schoolchild. Haiku amazingly reaches every class, every age. Eventually somehow I became known as a poet. My poetic work has had many influences: Scotch-English traditional ballads and folksongs, William Blake, Classical Chinese poetry, Walt Whitman, Robinson Jeffers, Ezra Pound, Native American songs and poems, haiku, Noh drama, Zen sayings, Federico Garcia Lorca, and much more. The influence from haiku and from the Chinese is, I think, the deepest, but I rarely talk about it. Though not a “haiku poet” I have written a number of brief poems, some of which may approach the haiku aesthetic. They also fit into a larger project which I call “Mountains and Rivers Without End” in which I am searching for ways to talk about the natural landscapes and old myths and stories of the whole planet. I am sure I have bitten off far too much, and my poetry might be better if someone just cut it up into little pieces. Over the years I have made many trips to Japan, and continued to learn from contemporary Japanese poets, especially Tanikawa Shuntarô, Ôoka Makoto, and Sakaki Nanao — Nanao is a truly unique figure. The contemporary Korean poet Ko Un’s very short Zen (Korean Son)–inspired poems are hugely pleasurable and very subtle. I enjoyed getting to know the haiku of Dr. Arima Akito through the translations of Miyashita Emiko and Lee Gurga. One person is laughing ! It is quite to be expected that Mr. Bonnefoy and myself, French and American, each in our own way, invoke haiku as a benefit and a value in matters of the troubled world today. People are always asking “what’s the use of poetry?” The mystery of language, the poetic imagination, and the mind of compassion, are roughly one and the same, and through poetry perhaps they can keep guiding the world toward occasional moments of peace, gratitude, and delight. One hesitates to ask for more.